Designed and built by Roger Alty over a 2 year period, the guest house is hand crafted with incredible woodworking throughout. 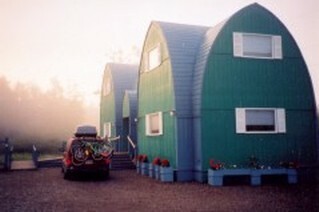 It opened in the fall of 2001 and features four spacious studio units with full bathrooms, micro kitchen with fridge, coffee maker, sink, microwave and satellite TV. 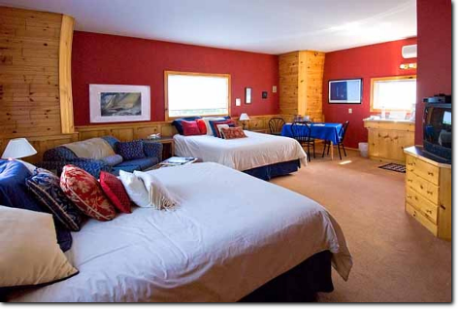 The lower two units have two queen-sized beds each and are wheelchair accessible. 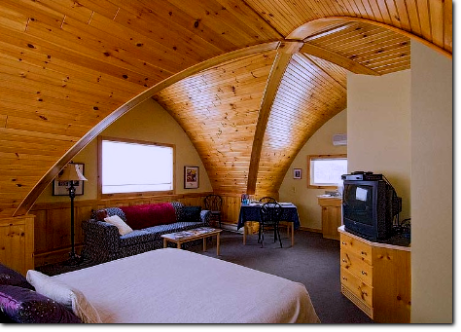 The upper two units have one queen-sized bed each, and it is in these two rooms that you get the full effect of the gothic arch design. Decorative gift boxes filled with yogurt, muffins and juice! Also available is "Gourmet-to-go"! Let us pack up your favourites for in-room dining, boating or picnics.